I should have known those remnant Portuguese genes would kick in sometime. My mother’s family claimed that they traced their heritage on one line back to Portuguese ancestors. Well, last year, Mrs. MM and I took a DNA test in the U.S. and it seems that at most, only 1.5% of my blood is from that area of the world. Mrs. MM is a bit more interesting with significant blobs of British and Iberian blood in her system. But that doesn’t seem outrageous at all… 100% first gen, 50% second gen, 25% third gen, 12.5% fourth gen, 6.25% fifth gen, 3.125% sixth gen, and 1.5625% seventh gen. Assuming none of my other ancestors had some blood from that area, then the completely “watered down” portuguese connection could have been 7 generations back or some 140-170 years ago, roughly 1830-50’s or so. Cool, huh?! That’s a long introduction to this simple but utterly fantastic guava jam, cheese, spread, which is also quite popularly known as “goiabada” in the former portuguese colonies, particularly Brazil, that had a surfeit of guavas. Mine!!!! !,,goes well with manchego cheese! I would love to try that goiabada on crusty bread. I would love to try that!!! ??? first time i tried guayaba in my husbands Tita who was a Cuban… She told me to put some queso crema and top the paste… It was so good that I had to introduce it to my friends ? … grateful for your recipe ??? I would love to have that. My mom and I would surely enjoy this on got pandesal in the afternoon over tea. I hope you pick me, my mom would love that. Thanks! Guava jam and cheese in one jar? Two of my favorite pan de sal fillings ? pls pick me?ive been dying to try guava jelly but I have a hard time finding guava. I love goiabada! I would love to try your iteration! Ah, I remember the wonderful combination of guava jelly and white cheese in Brazil. That goiabada would probably go well with kesong puti and hot pan de sal. Hope I can win this one as I’m craving for delicious jam lately! Goiabada is a mainstay of breakfast buffets all over Brazil, (as pasta de guayaba in the rest of Latin America) and paired as everyone seems to appreciate, with fresh cheese such as the famous one from Minas Gerais. But theirs is allowed to set firmer, closer to pâte de fruit and therefore served in slices. Yours appears closer to a product you featured once (sorry, can’t locate it), a tartine de goyabe sans pépites from Fauchon. You are the best MM! Thanks for sharing! It’s 3AM but I saw your post on Instagram and just HAD to visit your site and see if I have a chance to win a bottle of that. :) First time to comment, long-time reader. Looking forward to tasting your goiabada. I would love to have one from you. I am an avid reader of your blog since 2012 and I am one of your followers and likers on Instagram. As a former countryside girl, I always feel excited whenever you feature ‘strange’, ‘weird’ and unusual fruits, vegetables and recipes. I actually patterned my paella recipe from yours.hehe. Thank you for blogging about all those wonderful things. haven’t tried this, hope to be the lucky one. ha ha guava jelly with skyflakes reminds me of my nursing school days when Mom would send me this after our study period. My classmates and I would just devour them. Now with this goiabada, it will just make my day. Please pick my name, MM. My sister can pick it up and there’s a 7-11 in Barili. Would love to win this. Hope the digital lottery gods will favor me. I have an Facebook friend living in Manila who just recovered from breast cancer, I am giving this to her if I am the lucky one. She is a follower of Bo Sanchez and she posted in Bo’s Facebook that she wants to attend his meeting called “the Feast” but she doesn’t have money. I offered to pay so she could attend but another reader living in Manila also offered to pay. Anyway, we became Facebook friends. Bless your heart always MM. Like Farida, guava jelly brings back childhood memories! Life is too short now to cut back on this and that! If lucky enough to have a taste of your jam/jelly, I will find a way to have it transported over here, MM! The lurker in me surfaces. Gosh I hope I am lucky enough to be able to try this one out. It’ll probably quench my yearning for Porto’s guava cheese rolls. Congratulations to whoever wins this! Am sure it would taste as we all imagined it to be! I’d love to have a bottle of your creation, MM. Is it the same as the guava jelly you sell at Zubuchon? I bought a bottle years ago on a visit to Cebu, and it was superb with hot pandesal. not a fan of sinigang sa bayabas but i’m pretty sure i’d love this guava product of yours ? I’m tired of lumpia shanghai and usual appetizer menu-cheese sticks. This goiabada could be great as a filling…mmm..
I’ve never won anything in my life, perhaps winning this guava jam might change my luck @marketman! Thank you in advance! MM I think this is good as palaman in cassava puto that you featured before instead of bukayo. Have not had guava jelly for a looooong time. What a coincidence! I just made a few jars of guava jam. A friend gave me two kinds of guavas recently — pink and what she calls “guapple”. I made jam with the pink guavas and it was delicious paired with butter and homemade Challah bread. I have cooked the guapple too but have not had a chance to remove the seeds and add sugar. Pretty please pick me! :) it’s so hard to find good guava jam, much more goiabada in this part of the world. My dad will love this! looks delicious….wouldn’t mind trying it. thanks in advance. Please let me win (fingers-crossed)! My mom used to make guava jelly when I was a kid. Now that she joined our Creator, I never had a chance to get a taste of it again. I have tried guava jelly and cheese and it was good but I know with YOUR guava jam it will even be better. 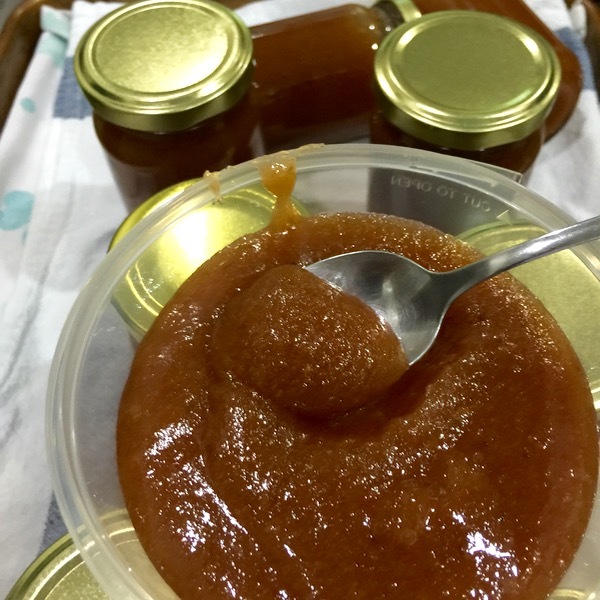 HI Everyone, thesis guava jam, NOT jelly… it’s thick and almost a slice thru consistency when chilled. Please let me win! Would love to try this guava jam! Here goes nothin :)) Jaaaaam!! probably to late and too far away – but still would love to taste that !! OH Wow! thank you MM, and perhaps I will get lucky with the Goiabada? Sir, will you share your goiabada recipe here in your blog? Crossing my fingers here! I was not able to open your blog as soon as you posted so since my chance of getting that free goiabada is very slim to none I’m trying my luck here if ever you will be sharing your recipe! And the winner is, MiMac! Yipee! **MM, please cut and paste this nalang. Hahaha! :) Will pick it up anywhere! Count me in! There used to be a lone guava tree on an empty lot beside our house that I used to climb to. It bears fruits year round. The fruits ripen usually after a heavy downpour. I remember having guinataan na bayabas as a staple while growing up. Sadly, the tree was chopped down to give way to a house built by a neighbour. A taste of goiabada will surely bring back sweet memories. Thanks, Marketman! I love guava jam! Eager to taste this Portugese version of it! I would to have that guava jam! Pick me!!! Wow.. everyone wants the jam!!! hoping to be the lucky winner :), Anaheim, California. Coz ill only be in the PH for 2 more weeks and would love to show off this jam back home in NL! Would definitely love to have one. Thanks! I just had my hair and make-up done. I wanted to post a photo but the comments section won’t allow me. Gusto ko lang malaman kung masaGUAVA o hindi. i would like to have a bottle, too!! joining the raffle is fun, fun, fun!!! Excuse me, MM. Just want to say hi to bettyq. How are you? Must be busy in your garden. Miss your comments and tips on MM’s posts. Hi MM, last week I used my homemade guava jam as a filling for my (birthday) chocolate cake and it was delicious! I will be very delighted to taste your “goiabada”! Tasting something new surely makes my day! Is this only for Philippines-based readers? If not, I would like to give it a try. Would love to make a schmear of guava jelly and cottage cheese on pita bread, FTW!!! Taking a chance at this :-) Already imaging the flavor! I’m in the US but have family in Manila that will love this. I can’t wait to taste this goiabada! Let me win one, please? Ginger, pick my name, please? I promise to give you a nice, juicy bone. Guava and cheese together make an interesting combination. I hope i get lucky enough to have one from you, Marketman! It will bring me down memory lane….decades back when I can just finish a bottle and make it a paté like over skyflakes and fita. Sarap! I know I’ll be tasting your jams but hey, I also want to try your goiabada, thank you. Waiting for the winner to be announced…..